But a partnership in Chartered Accountants and Business Advisors Kelsall Steele soon led to further opportunities. Firstly, the chance to grow a specialist market in delivering accountancy, taxation and other services to the Chiropractic profession. Mike soon became very well known in the profession. It wasn’t long before Mike and his team became the largest provider in the UK of accountancy and tax services to the chiropractic profession. A position his team still holds. But on Mike’s journey he realised just how dull accounts can be. That is not to say it is not important, its just that clients found it hard to connect with balance sheets and profit and loss accounts. Hours spent burning the midnight oil in advance of meetings ensuring the balance sheet balanced to the penny just never got on the clients radar as their eyes glazed over at the very mention of debtors, creditors and work in progress.Yet the purpose of the all these figures remained critical to the business’s performance, understanding what was going on was fundamental. Mike then trained in Neuro Linguistic Programming, becoming a master practitioner. New skills helped communicate the messages that were important. Clients became connected with their businesses. Mike made new friends. The business boomed. With the new founds tools and techniques Mike jumped at the chance to start a Dental Consultancy business with his friend Dr Simon Hocken, ex dentist and business coach. The business flourished and very soon became the largest in the UK. As did Mike’s knowledge of dentists and his ability to apply the lessons learnt in chiropractic to the dentistry model. More clients became connected with their businesses. Mike made many many more friends. Business was good and growing. Mike realised that amongst the instruments the clients needed to run their business they were often frustrated by the enormous level of tax payments that fell due every 6 months. Mike pioneered the incorporation of businesses (notably dentists and chiropractors) that allowed business to take advantage of some very simple tax advantages. And for those who couldn’t incorporate Mike encouraged a tax planner to take a look at some straight forward ‘contractor planning’ and apply it to the healthcare sector where both dentists and chiropractors could take advantage of opportunities that existed. A business opportunity that is fast becoming industry standard in the healthcare sector. Once again, Mike had been instrumental in leading the market. And then there was The Peloton….. The world was changing, the digital age was upon us and it was time to take advantage of these changes and move the business to a brand new innovative space. Firstly let’s put accountancy in bed with marketing. Brave or common sense? Common sense!! 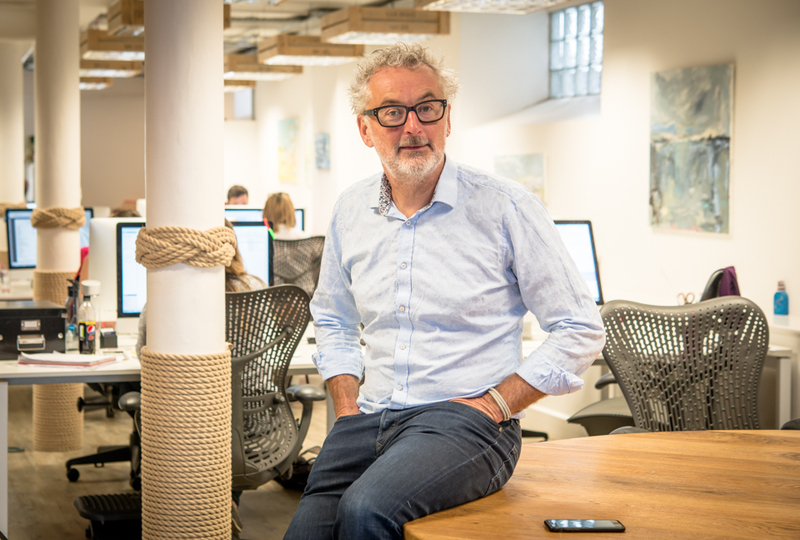 Widely acclaimed as the most desirable office in the West of England, Mike single handedly designed and created the exciting and contemporary interior of The Peloton in an old warehouse on the town quay at Penryn. Drift wood floors, glass offices, lights in old fish crates, white Italian desks, leather sofas and home cooked lunch everyday for everyone – team and clients alike. And with it created a culture where, given the environment and the best of everything, the team could flourish and in turn give the very best to their clients. And that is exactly what has happened, Mike has built the most incredibly innovative team that build fantastic relationships with their clients and deliver outstanding service and absolutely top drawer accountancy, tax and business advice. A culture where only movers shakers and doers can stand the pace. A team that wins, just as the Peloton was designed to do.